What a great thrill it is to see something start from a small local idea and take on a full national impact. 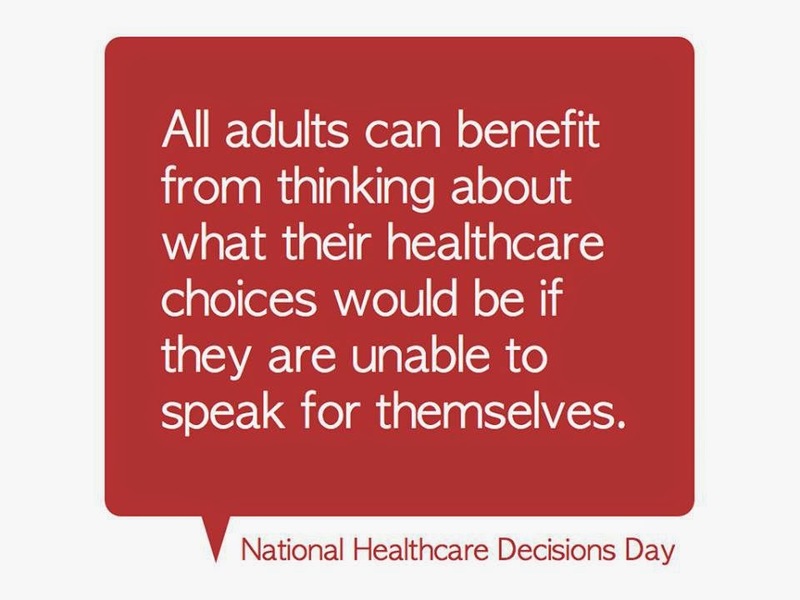 National Healthcare Decisions Day (NHDD) is today, Wednesday, April 16th, 2014 and so many more organizations are getting involved, beyond those who might naturally be inclined to assist their community with advance care planning. Many healthcare organizations, employers and communities are mobilizing today and this week to make sure that patient’s preferences wishes are being documented and recognized by the medical community. I even saw it on my health insurance employee wellness homepage! Since the manufactured outrage over non-existent ‘death panels’ has appropriately faded, I think many people feel much more confident in addressing these issues. And interestingly it seems as if advance care planning is becoming a growth niche with so many different local, regional, and national options supporting this effort. So with all these options it is even more critical for health care providers and health advocates to be informed and involved with the people making these decisions. If you are thinking to yourself, “Darn it, I always forget about NHDD every year and have always wanted to help and get involved,” well there are still some simple yet effective things you can do today! Post by National Healthcare Decisions Day (NHDD). If you are seeing any innovative efforts on NHDD today, please share them in the comments below, on Twitter, or on Facebook. Happy NHDD! NHDD Speak Up Video from NHDD on Vimeo.